With their superb plumage and distinctive, endearing calls, eiders are a much-loved sight around the coast of northern Britain. In the breeding season, the male is easily identified by his pristine black and white plumage, beautifully complemented by a subtle green nape and a soft pinkish flush on his white chest feathers. By contrast, the female is brown with an intricately barred pattern. Here are 10 things that you might not know about them! The Common Eider, Somateria mollissima, is Britain’s heaviest duck, weighing between 1.5 and 2.5 kg; and with a body length of up to 71 cm, it’s also the largest duck in the Northern Hemisphere. Surprisingly, it’s also the UK’s fastest duck in flight, with speeds of up to 60 mph. In AD 676, the colony of eiders on the Farne Islands was protected by St Cuthbert who introduced one of the first bird protection laws. The birds still bear his name: around the Northumberland coast, where they still breed in their thousands, they’re known as ‘Cuddy ducks’. 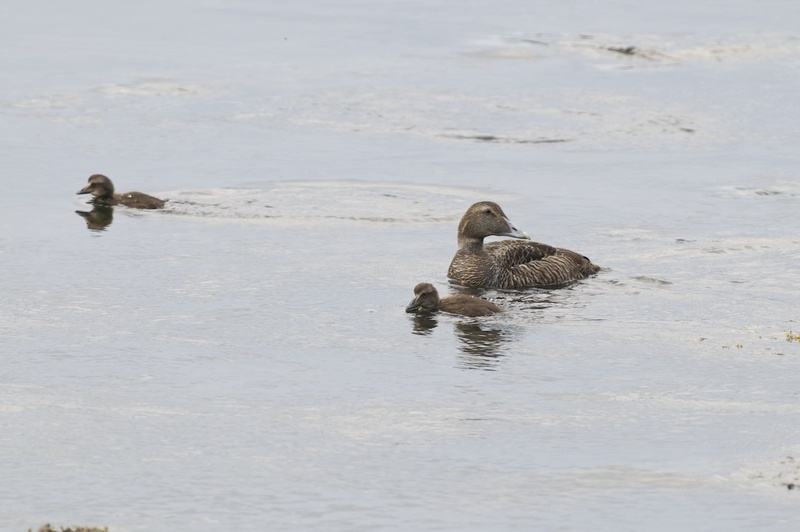 Eiders feed on crustaceans and molluscs. Mussels are their favourite food, which is why they’re often seen around mussel farms. They swallow the shellfish whole, and the shells are crushed in their stomachs. Walney in Cumbria has the southernmost breeding colony of eiders in Britain. The first nests were recorded in 1949, and numbers rose to 1,500 in the 1990s. The level has since dropped to between 200 and 300 nests. Eiders are resident in Scotland and north-west England, but in winter they can be seen around the coasts of Yorkshire, South Wales and even Cornwall. Earlier this year, an autonomous group of Finnish islands known as Aland approved the spring hunting of Common Eiders, despite their decline in the Baltic and an EU ban. BirdLife Finland has issued a complaint to the European Commission. In Greenland, eiders often nest near tethered huskies, a clever tactic which protects their eggs and young from predators. The female eider lines her nest with feathers plucked from her breast; in Iceland, where the feathers are harvested, the contents of 85 nests will fill one duvet. Britain’s Common Eider population has been recorded at 31,000 pairs in summer, and 73,000 individuals in winter. Preferring coastal islands for their nest sites, eiders often choose the place where they themselves were hatched. Females with young will often get together in large groups to form a ‘creche’ where the youngsters can dive and feed in safe waters.